THE RYANAIR PILOT Group (RPG) today called on Michael O’Leary to honour his commitment to negotiate with its representatives on a single contract for all pilots. Previously, the airline chief had said he would accept the need to deal with the group if it had in excess of 1601 members which it confirmed today. The group claims to represent well over 50 per cent of the pilots flying for Ryanair. 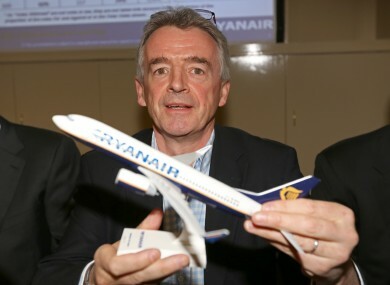 “Accordingly, on behalf of the majority of pilots flying for Ryanair, we call on you to honour the public statement you have made in respect of engaging with the pilots’ representatives,” RPG said in a letter to O’Leary. Our purpose in representing RPG members is to ensure the interests of pilots flying for Ryanair are met while at the same time ensuring the long term sustainability of the company is assured. Today the group held a a press conference in Brussels and said that “increasing uncertainties” about the Ryanair employment model are being uncovered through court cases in many countries. Reinstatement of any colleague threatened, disciplined or sanctioned in the course of establishing this new representation process. The group said that new contract arrangements would enable pilots to fully contribute to the success of the company. Email “Ryanair Pilot Group calls on O'Leary to negotiate single contract”. Feedback on “Ryanair Pilot Group calls on O'Leary to negotiate single contract”.